Finally, a patent pending rock guard solution that looks as great on the road as it does off the road! LUND's exclusive Rock Rail is a modular system that offers truck owners a choice of a double or single step rail that can quickly be removed, leaving the rock rail base to protect the Jeep body when hitting the trails. The revolutionary modular Rock Rail system is constructed of fully welded 3mm thick mild steel with a black wrinkle powder coat for years of rugged and durable service. 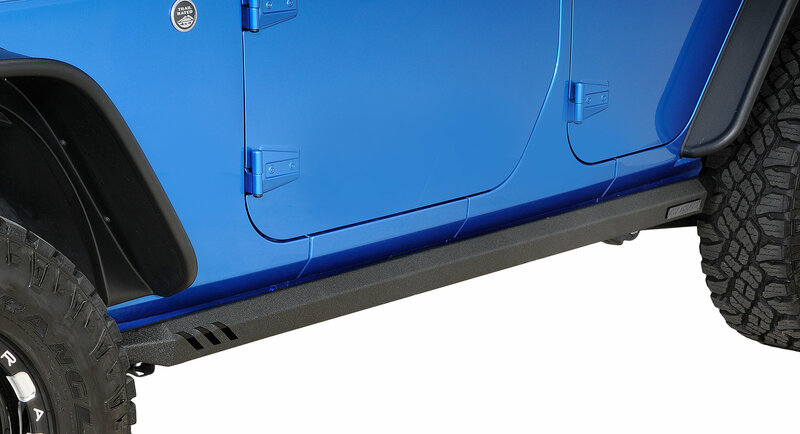 Protecting your Jeep's body from on road and off road rocks and debris, the Rock Rail system delivers unique style with premium performance. LUND's Rock Rail system is more than tough enough to protect your Jeep from most off-road terrain. Give your wild side an excuse to run free, while your sensible side maintains a great looking set of step rails for daily use. As with all LUND products, the LUND Rock Rail System is backed by a Limited Lifetime Warranty.